Che bella la prima vera in Italia. I began this letter sitting on the terrace of Le Campestre, one of the most beautiful and tranquil locations I have experienced in Italy. Le Campestre, an agriturismo , is just outside of Castel di Sasso, an ancient borgo, in the region of Caserta. It is owned and operated by the Lombardi family. There are four generations to this family, all in gamba (on their leg); the youngest, 18 months, the oldest, 88 years. I have written of Le Campestre in the past and will probably do so in the future. I am already thinking of when I can return. NAPLES, ROUND ONE I had begun this trip in Naples where I planned to spend time in the city and at some of my favorite pizzerias before and after heading to Caiazzo. Not only was I able to spend time with Adolfo Marletta of La Spaghettata and Antonio Starita in Materdei, two of the greatest pizza makers in Naples, I went south to Palinuro in the Cilento with my friend Domenico Mazzini of the B&B Donna Regina. Upon arriving I had the good fortune to dine at the La Stanza Del Gusto with Mario Raffone, Domenico’s uncle and one of the last master lithographers in Naples. The Stanza Del Gusto (www.lastanzadelgusto.com) is quite interesting. Located by the Piazza Bellini, its owner Mario Avallone has made it his life’s work to honor and showcase “slow food.” It truly stands by itself. It was a wonderful way to begin, sitting down with the two Marios and soaking up their thoughts on honey, wine, cheese, tomatoes, vinegar, prosciutto, mortadella, oils and more. Starting this way set the tone for the dialogue that transpired each and every day. Every artisan, whatever their product, has their own method and tradition. And while each has their own take on what is right, what they have in common is their love for what they do, and passing their knowledge from one generation to the next. An evening of pizza with Domenico at Di Napoli in Fuorigrotta was the prelude for Caiazzo and my extended visit with the Pepe brothers. Situated away from the centro storico (historic center) of Naples, Pizzeria di Napoli is not as well traveled by tourists as Da Michele, Di Matteo, Trianon, and other well-known local destinations. But since 1953, this family-run pizzeria has had a serious following. If you are a pizza lover appreciative of its finer attributes, this pizzeria is not to be missed. Light and airy, a touch of resistance with the first bite, and top ingredients: I was impressed. And so well primed, I was on my way toward Caiazzo. Caiazzo is a good forty minutes drive from Napoli. A small town of 5000, it is quite beautiful. Its history is long. Once in the hands of the Romans (306 B.C. ), the Lombards, Arogonese, and the Kingdom of Naples have all been there. Besides pizza, there is wine, olive oil, and mozzarella. Over the course of my stay in Caiazzo, I learned about the local indigenous grapes, Casavecchia and Pallagrello, and sampled the local olive oil. Le Campestre is near Caiazzo and there I again enjoyed the ancient conciata romana cheese and prosciutto nero that is lovingly produced by Liliana and her family. An afternoon walk with Liliana to look for wild asparagus, flowers, herbs and other greens to eat was a special treat. I was treated like family and felt truly at home. With open hearts, I was welcome in the kitchen. Recipes were shared. The Mastroberardino Estate also treated me with kindness. We have many of their wines on our list. Through Dario Panino whom I had met in Chicago and who is a director with the Estate, I was picked up, given a tour of their operation, had a wine tasting of the newest vintages, and visited with Dottore Antonio Mastroberardino who is of the 9th generation. A wonderful lunch followed at their newly established Radici Resort. (www.radiciresort.com) Along with Casavechia and Palagrello from Terre del Principe, (www.terredelprincipe.com) we will be introducing Villa Dei Misteri from Mastroberardino which is made from a grape discovered and cultivated at Pompei. How ancient is that! The core of what brought me to this region of Casserta was to work with Franco Pepe and his two brothers, Nino and Massimiliano, at their family’s Antica Osteria Pizzeria Pepe. Franco and his brothers are part of the third generation of this greatly respected pizzeria. In 2011 Franco was among two other grande pizzaiuolo’s, Gino Sorbillo (www.academiapizzeria.com) and Enzo Coccia my former teacher, of Pizzeria La Notizia in Vomero (www.enzococcia.it) who were asked to demonstrate their work to a group of internationally renowned chefs, food critics and personalities in Rome. I met Franco in June 2010 when Ginny and I were on route to Le Campestre for a brief visit. I wanted to show Ginny these two beautiful trees in nearby Caiazzo’s small piazza and by chance had just read about the pizzeria in The Food and Wine Lover’s Guide to Naples and Campania by Carla Capalbo while we were on our way to Caiazzo. I was really excited by this discovery and decided I could not leave this town without having one of their pizzas or at least meeting the brothers. Our timing did not allow for eating, but we did get to meet Franco. After leaving Caiazzo Franco and I continued to correspond. A year later I was able to return to spend a week in residence with him. Franco makes the impasto (pizza dough) by hand. I had the opportunity to be witness to this tradition in motion. Each day is unique and requires serious thought as to the precise mix of flour, water, salt and lievito madre (mother yeast) that will be used. I trust there are very few pizzerias in Italy and around the world that make the dough in the manner Franco does. Though he is a member of the APN, he refers to his pizza as “pizza del nonno” (of the grandfather) as opposed to “Neapolitan”. Though there are so many facets to making a good pizza, the dough, to my mind the dough remains its uncompromising foundation. My first two weeks of training with Enzo Coccia in 2004 required making dough by hand--no easy feat. Being with the fratelli Pepe (the Pepe brothers) was a chance to deepen my understanding. It is amazing to think of the particular history that is the essence of this one small pizzeria in the tiny town of Caiazzo. The love and reverence for their father and grandfather, who are of the first and second generations of Antica Osteria Pizzeria Pepe, cannot be described; it can only be felt. To be part of their rhythm, to have dialogue and share ideas was wonderful. Pepe and his two brothers warmly welcomed me into their pizzeria. I believe my passion for La Pizza helped foster this. Franco and I are similar, in that we share an excitement, a quest even, to do our best to make something wonderful that nourishes both body and soul and to share it with others. Pizza is primal for us, like mother’s milk. I watched and listened as Pepe made his dough by hand every morning. We talked of the various flours, the gluten, sugars (simple and complex) and amino acids. We talked of elasticity, dough memory, digestibility, fermentation, oils, tomatoes, cheese, salumi, everything! We even went to presentations on flour (Petra) and visited Molino Caputo. Afternoons were spent visiting other local artisans, having lunch with his family, and returning to the pizzeria for the evening’s work. By the end of my stay, I felt I was no longer a passive participant; I was the part of their celebration of La Pizza, a member of the family, a fourth brother if you will. It was with great sadness that I made my way back to Naples. And so returning, with videos in hand, I visited some of the locations where the previous year I had collaborated with Sky Dylan Robbins (www.skymedia.tv) as she made her documentary, Un’ Americana in Italia which is about the spirituality of food. It was fun and greatly satisfying to share the finished film with those who are in it. You can see individual episodes of Sky’s documentary on the videos page of our website. I have been running around this city since 2003, and my questions seem to have no end. So even on this trip, I took more videos, and spent more time talking philosophy, being allowed access to kitchens and being invited to share in the staff meal. Adolfo Marletta of La Spagetatta in Vomero was more than generous with his time. Besides Franco Pepe, Adolfo and Antonio Starita were the two pizza makers I most wanted to spend time with; to watch hands, discuss flour and their methods of making dough. Throughout my journey, there was reference to the changing nature of flour over a long time. Today’s production often has more gluten, is stronger and more elastic. Because of these changes the methods of extending dough by hand that Adolfo’s father did in the past, Adolofo and other pizzaiuoli must adapt in the present. The only wish left on my plate in Naples was to spend a day with Antonio Starita in Martedei. As with Pepe, the opportunity to be with Antonio is an honor. 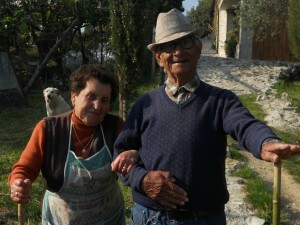 He is considered one of the greatest pizza makers in Naples and has always been generous with his knowledge and time. We began the day making the impasto together. Though our methods are similar, I always learn from him. As the lunch hour began, I moved over to the pizza bank and focused on the hand movements extending the dough and topping the pizzas. It was a beautiful Saturday afternoon and there was great excitement on the street and in the pizzeria. Easter Sunday was the following day. Everyone was happy, the children were jumping up and down. It was quite nice to hear one woman, child in hand, telling Antonio that as a young child she would often come to Starita with her nonna (grandmother). The memories continue to be made. To ease my transition back home, I ventured south to Palinuro and the Cilento with Domenico. Making our way past Gragnano, the Amalfi Coast and the magical Greek ruins of Paestum. I was anxious to return to this land of wonder, believed to be where the sirens called out to Ulysses. I was in for a treat: natural beauty, good food and wine, visiting the newly opened and quite interesting Club Farine Med and once again venturing into the Cilento National Park. We woke up to Easter Sunday and had a wonderful afternoon meal overlooking the sea. It was fun to sample the various casatiellos, each one different in its own way. The evening was spent at the Club Farine Med. Using local biologico product, pizzas are closely tied to the areas from which the ingredients came. How can one go wrong when using carciofini di pertosa (baby white articholes) or alici di menaica (fresh anchovies). Franco Fucciolo makes the pizza. Domenico’s’s cousin Nicholas Raffone is the owner. Only open since February, the dough is quite amazing. Franco and I had met the previous year and of course, had bonded over pizza. At most pizzerias, I am slow to jump in. This time was different, I could not resist. Remembering a pie introduced to me by Roberto Caporuscio of Keste in New York, I made one with four mini calzones. At four points of the pie, the cornicione is folded toward the middle with something stuffed inside. The middle is left open with enough room to create another topping. Very playful. The day after Easter in Italy is a favorite of mine. Pasquetta, “little easter,” is a day of celebration. We drove into the Cilento, making our way to “Cono,” (www.dacono.it). Dacono is a very special agriturismo. Situated near the medieval town Larito, it has a particular spirit and mystique. Goats abound and the setting is spectacular. We feasted with many other families. There was traditional dance and song, the wine vero and sincero. What a way to end the trip. Well almost. I could not leave Italy without returning once more to the fratelli Pepe in Caiazzo. I showed up in my whites, ready for work. It was a pleasant surprise and truly appreciated. I was happy to see them and they me. Late into the night, we worked. With only a few hours before I needed to begin my journey home, we celebrated with a sparkling Greco, focaccia, and salumi. I know this letter is long. I apologize, but so much happens for me when I make these travels. Food, wine and family bring us all together. Whether it is Turkey, Tunisia, the Gargano or the Cilento, I continue to experience the great willingness people have to share with those who express an interest to learn or just to appreciate. I guess you could say I have fallen in love all over again, with all things pizza. And maybe with Franco Pepe. Don’t tell Roberto. My wife however, does know.